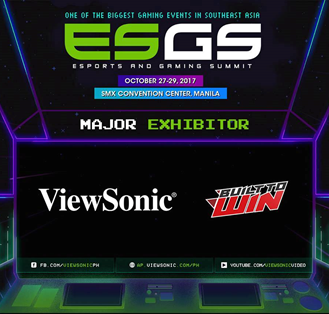 ViewSonic Corp., a leading global provider of visual solution products, today announced it will be exhibiting at Electronic Sports and Gaming Summit (ESGS) 2017, one of the most anticipated e-sport competition and gaming convention event in the Philippines, from October 27 to 29 at the SMX Convention Center, Metro Manila. ViewSonic is coming to ESGS as an official major exhibitor and will be setting up an experience zone where its XG Series gaming monitors will be showcased. From first-person shooters and real-time strategy to multi-player or action-adventure gaming, ViewSonic’s XG Series of gaming monitors is packed with all the professional-level features needed for that competitive edge that leads to more victories. ViewSonic’s XG Series is specially engineered to meet the demanding needs of gamers and is loaded with the premium features needed to dominate and defeat any and all opponents. Leading the frontline is the XG2530 25-inch (24.5-inch viewable) gaming monitor packed with all the speed and features that diehard gaming enthusiasts’ demand. Featuring a native 240Hz refresh rate, AMD FreeSync Technology, as well as a blazing-fast 1ms response time, this monitor virtually eliminate screen tearing and stuttering for fluid gameplay during fast-paced action scenes and provides smooth screen performance even in the most graphic-intense sequences. ViewSonic will also showcase the highly anticipated XG2402 gaming monitor designed with a more gaming friendly low profile base that allows for the flexible keyboard placement popular among FPS players. In addition to the super-smooth visuals achieved via the 144Hz refresh rate, 1 millisecond response, and AMD FreeSync support, the XG2402 improve upon the success of previous competitive gaming models with the most customizable viewing options on the market and specialized gaming presets.